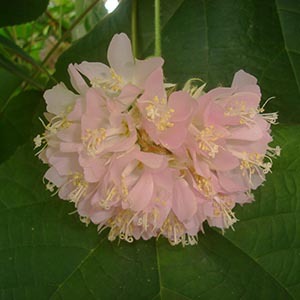 Dombeya x cayeuxii is a vigorous, evergreen, tender shrub, which has round clusters of pink, exquisitely sweet scented flowers. Dombeyas are native to Africa and Madagascar, but this one is a man- made hybrid between D.burgessiae and D.wallichii. The flowers almost look like pendant Hydrangeas. The sugary scent is so strong that you often smell the flowers before you see them, with the scent travelling several metres! Ours is scenting our Subtropical House ramp and walkway now.